Stall bookings are now open. Cumbernauld Gala Day is an annual event organised by Cumbernauld Community Forum in conjunction with several other local organisations. Cumbernauld Gala Day will this year take place on Saturday 15th June at Cumbernauld New Town Hall, with acts, entertainment and festivities being finalised for what we hope will be the biggest Gala Day in Cumbernauld yet. As part of our planning, stall holders are put at the centre of the event, and we are delighted that you are interested in bringing your business, charity, club or organisation to our event. To get booked up, simply download, print and fill out the form available by clicking here: Cumbernauld Gala Day 2019 – Stall Booking Form. Once you have done that, please post or hand in your form to Cumbernauld Community Forum, c/o Link Community Centre, Bron Way, Cumbernauld, G67 1EW. If you have any questions, please use the contact details on the booking form. Cumbernauld Gala Day will this year take place on Saturday 16th June at Cumbernauld New Town Hall, with a whole day’s schedule of acts, entertainment and festivities currently being finalised for what we hope will be the biggest Gala Day in Cumbernauld yet. To get booked up, simply download, print and fill out the form by clicking here: Cumbernauld Gala Day 2018 – Stall Booking Form. Once you have done that, please post your form to Cumbernauld Community Forum, c/o Link Community Centre, Bron Way, Cumbernauld, G67 1EW. While you’re here, please don’t forget to join our Facebook event. Let us – and your friends – know that you’ll be coming along to this year’s Cumbernauld Gala Day by hitting the ‘Going’ button on our Facebook event page, just click here. Volunteers from Cumbernauld Community Forum are busy starting to pull together the usual great line-up of food, live entertainments, shows and stalls for Cumbernauld Gala Day 2016. This year’s event will take place on Saturday 18th June, at Cumbernauld New Town Hall. More information about this year’s Gala Day will be made available via the ‘Cumbernauld Gala Day’ page on our website within the coming weeks and months. Please do not submit your booking form electronically – only forms received by post will be considered. Please note that early payment is recommended but the final deadline for all payments to be made is Friday 17th June 2016. ASIST; is for caregivers who want to feel more comfortable, confident, and competent in helping to prevent the immediate risk of suicide. Over one million caregivers have participated in this two-day, highly interactive, practical, practice-oriented workshop. SafeTALK; is a training that prepares anyone over the age of 15 to identify persons with thoughts of suicide and connect them to suicide first aid resources. The course takes 3-4 hours to deliver. SuicideTALK; is a 60 minute exploration in suicide awareness. It is intended for all members of a community ages 15 and over. If you are interested in taking part in the three courses offered please use the hyperlink to the Elament web site Mental Health Training for dates and application forms or contact Aileen Thomson at ThomsonAi@northlan.gov.uk and on 01698-332707. Cumbernauld Community Forum recently received a presentation from NHS Lanarkshire regarding proposals to reduce their Out of Hours service to either two facilities in Airdrie and Hamilton, or just one centre in Hamilton. Cumbernauld Community Forum is opposed to these proposed changes and the continued detrimental cuts to health services in the Cumbernauld area. A standard letter of response has been prepared and is available to download by clicking here. A public meeting for the Cumbernauld and Kilsyth area will be held on Tuesday 10 March from 6:50pm at Cumbernauld New Town Hall, Bron Way, Cumbernauld, North Lanarkshire G67 1DZ. A NHS Lanarkshire press release has been issued today confirming the outcome of a successful campaign by Cumbernauld Community Forum to retain NHS beds in Carrickstone Care Home. All existing 35 NHS beds at the facility were under threat, pending a review by NHS Lanarkshire, but the revised contract agreement announced today will secure 25 of those for local older people. The revised contract agreement will see Four Seasons continue to provide the facilities, nursing, administrative and hotel services staff at Carrickstone with NHS Lanarkshire providing the medical input, both consultant and GP, and some input from allied health professionals. Billy Lees, Chairman of Cumbernauld Community Forum, said: “It is great news for the people of Cumbernauld that NHS Lanarkshire is going to keep 25 beds at Carrickstone Care Home. It is important that there are enough beds available for people that need them. We have been saying this throughout the review and we are pleased that it has now been confirmed”. Donald Masterson, Health Spokesman for Cumbernauld Community Forum said: “We are delighted at the outcome. It shows how important it is to have the public involved in the decision making process to ensure we get the right result for Cumbernauld”. The full text of the NHS Lanarkshire Press Release can be viewed by clicking here. 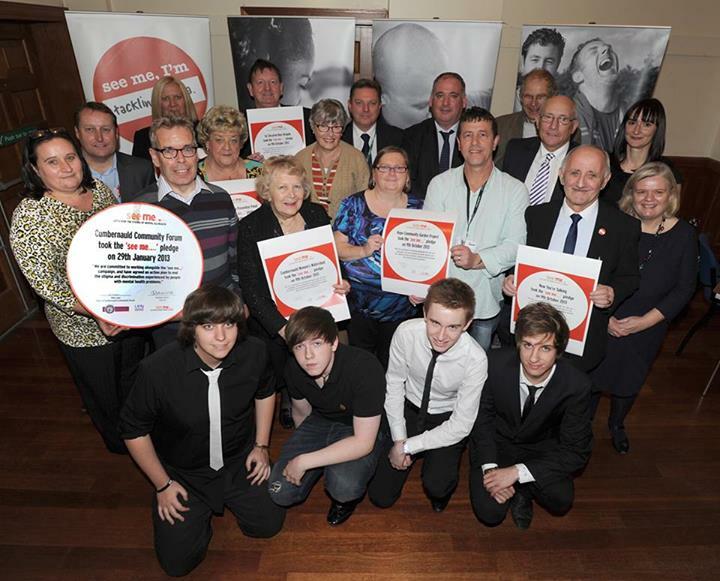 On Wednesday 9th October, Cumbernauld New Town Hall was close to capacity for the latest See Me Pledge Signing event. Local groups and organisations; including Sanctuary Cumbernauld, Cumbernauld Women’s Watershed, Hope Community Garden, Now You’re Talking, and Abronhill High School; came along and signed up to help end the stigma and discrimination of mental ill health. As well as the pledge signings, attendees also heard personal experiences of mental ill health, how it can affect anyone at any time, and how important it is to receive help and support. Local band Falconhoof closed the evening with a great performance which included their new song, appropriately titled ‘See Me’. The turnout was fantastic and hopefully more local groups will now be inspired to sign the See Me pledge themselves. Anyone who wants more information on the See Me campaign should access the website at www.seemescotland.org. Welcome to the website of Cumbernauld Community Forum. On this site you can find more information on the work of Cumbernauld Community Forum and some of the projects and initiatives we have been involved in, along with details of our monthly meetings. If you have any comments or queries, please get in touch using the ‘Contact Us’ link in the menu above. 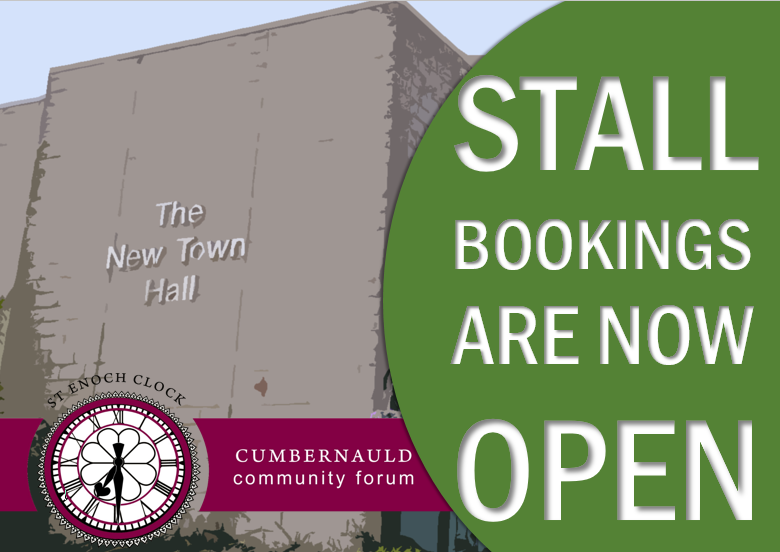 Cumbernauld Community Forum meets on the second Tuesday of every month at 7pm in New College Lanarkshire: Cumbernauld Campus.